7th Professional Development Training during March 26-30, 2019 was successfully completed and was attended by more than 30 participants comprising of Professors, Associate Professors, Assistant Professors from engineering colleges across the states of Chhattisgarh, Madhya Pradesh, Haryana, Jammu & Kashmir, Maharashtra, Jharkhand, Orissa, Rajasthan, Tripura, Uttar Pradesh, Uttrakhand, Gujrat, Karnataka, Tamil Nadu, Bihar, and Telangana. Prof. Archana Parashar and Prof. Rashmi Shukla were the program directors for this training program and the TEQIP coordinator was Prof. Sanjeev Prashar. On the last day, March 30, 2019 the first two sessions were conducted by Prof. PRS Sarma on ‘Procurement Management’ and ‘Workplace Management (Stress Management)’ in Hotel VW canyon. The session on ‘Procurement Management’ was designed with emphasis on “Best Practices” in Procurement Management in Academic Institutions. The session was designed with an objective to make the participants to understand the importance of “Effective Management of Procurement Process” of various activities involved in the process and attempting to draw the advantages from the implementation of world’s best practices in their respective institutions. The session on ‘Workplace Management (Stress Management)’ focused on the psychological effects of stress on human body. 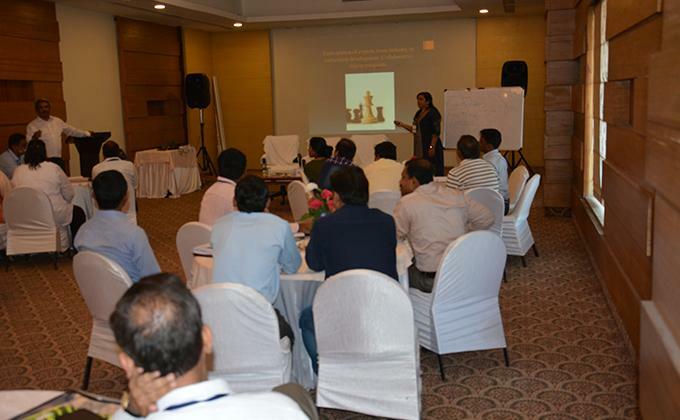 Participants were engaged in different brain storming exercises and discussed personal and professional stress. Further, multiple stress management techniques were discussed with the participants. Third session was taken by Prof. Mohit Goswami on ‘Relationship Management (National/International Universities/ R&D Organizations)’. The session discussed on the purpose of academic collaboration and invited discussions around how do individuals and organization can initiate the international collaboration. The last session was scheduled ‘Project Presentations’ where the participants presented their learnings to the program directors. The groups with 5-6 participants presented and shared their learning on different project titled such as ‘Feedback System for Technical Institutions’, ‘ICT Implementation – Current & Future Plans’ and others. The participants shared their overall experience and key learning from this five days TEQIP program. More such programs shall be organized for Faculty Members, Heads of Institutions and Administrative Officials of the Engineering Colleges at IIM Raipur.